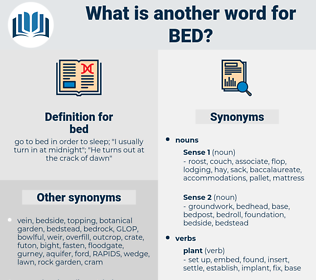 What is another word for bed? go to bed in order to sleep; " I usually turn in at midnight"; " He turns out at the crack of dawn"
hibernacula, seamen, dive, pile, berth, couch, layer. bedside, bedroom, bedspace, bedlinen, sea-bed, mattress, sack, feather, gurney. surface, wakefulness, sleeplessness, consciousness, insomnia. Now come off to bed both of you. sleeping room, sleeping accommodation, bedroom, press, chamber, printing press, bedchamber. twin bed, railroad bed, bed of flowers, trundle, truckle, bunk, plank-bed, flower bed, single bed, sleigh bed, marriage bed, sickbed, murphy bed, asparagus bed, hammock, sack, trundle bed, deathbed, bunk bed, roadbed, double bed, four-poster, hotbed, platform bed, couch, seedbed, turnip bed, flowerbed, cot, built-in bed, berth, water bed, truckle bed, camp bed, built in bed. streambed, sea bottom, ocean floor, ocean bottom, ore bed, Davy Jones's Locker, lake bed, river bottom, Davy Jones, sea floor, lake bottom, creek bed, riverbed, seabed. foundation, groundwork, base, plot of ground, foot, plot, patch, understructure, bedroom furniture, surface, fundament, substructure, plot of land. put, set, place, pose, plant, position, lay.